Easy ways to make your push up harder is to perform it slower (more isometric) and to perfom it with less contact points or to make those contact points instable by placing your hands on an excercise dome or a ball. So your body has to work harder with balancing itself. I'll try to keep this topic as updated as it can be, if you know a variation which we didn't name here, post it and i'll add it to the list. We'll try to categorize the push ups in level I, II and III (beginner, intermediate and advanced). Easier than a basic push up, by doing it against a wall you reduce the weight. Placing your hands on a table, bench etc. so your upper body is elevated. Reduces the weight a littile, but less if you compare it to wall push ups. Instead of supporting on your feet and hands you support your body weight on your knees and hands. Important to keep your body in a straight line. As you all know it great foundation for your overall fitness! 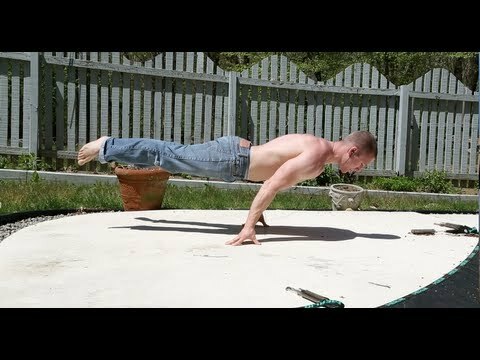 Do a basic push up, if your up tap your shoulder/hand. This makes the excercise more isometric and improves your balance. After doing a push up, point one of your hands to the sky. Do another push up and point to the sky with your other hand. This variation will target your obliques and shoulders more than a basic push up. You can make it even heavier by push up on dumbells and bringing the dumbell up. Push up followed by a thigh tap or a arm raise (raise your arm in front of you so it makes a straight line with your upper body). Improves stability and will make it more isometric. While pushing up bring your leg up, switch legs when doing the second push up. 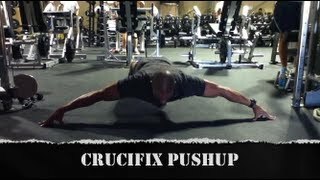 Push up while on dumbells, allows you to get deeper, will hit more triceps. Push up on the knuckles, know to all martial artists here probably. explosive push up, get your hands of the ground for a while. Harder if you clap your hands or tap your chest. One of your hands is placed more forward than the other, don't forget to practice it with both hands. Go down slowly in about 5-7 seconds and get up fast. Bring down your leg under your body, other than in the video you could twist your upperbody more and perform it with a bend or straight leg. Like the cross body, you kick with one of your feet under your body. Slightly wider hand placement, push up to right or left side. Push ups on dumbels, add a back row after push up. Turn around your hand 180 degrees so your fingers point to your feet. Push up, when up do two small steps forward on your toes. Place your hands against eachother, works your triceps and inner chest even harder. Wide hand placement, you'll hit your outside chest more. Place your foot on a bench, or something higher than the ground. The higher the more it works your shoulders. You could also place them on an aerobics ball for extra instability. When your down hold for 3-7 seconds and get up, don't rest on the ground! Push up with one hand on a medcine ball, when in plank position roll the ball to your other hand and perform the next. Handstand against a wall, push up. Add weight with a vest, a partner lying on you or some loose weights. Use a resistance band to make it harder for yourself to push up. You could also place your foots in the strap, make it high lower or higher. Balance is a lot harder. You can also perform this on round dumbells, just roll one of the dumbells away from you and get it back. Clap after pushing up, next level clap behind the back. Clap in front of you than after your back and if you can clap again. Last edited by Facta_non_Verba; April 24th, 2015, 04:53 PM. Level 3 is really impressive!!! Facta_non_Verba these are fantastic! thank you very much! where I come from they call the Hindu push ups "dive bombers"
Nice! There are many of these that I didn't know!